Quiche is one of those dishes that goes in and out of favor with the trendy set, but I've always liked it. And it was a mainstay in my vegetarian days. In those days, I was seriously into nutrition as well so always made the crust with part whole wheat flour. Years later I had the opportunity to have a little chat with Julia Child about that! My mother and I enjoyed reading cookbooks and watching PBS cooking shows together, especially Julia Child's, when I was just a child. I had all these "warm fuzzies" associated with Julia, since I spent so many hours in the kitchen with her (courtesy of PBS) and my mother. When I finally met Julia, it felt as if I were reuniting with a beloved aunt who had been a part of my childhood. It was sometime in 2000 or 2001 that I first met her. As a great admirer of hers since childhood, you’d think I’d have recorded the exact date of that first, and a few subsequent, meetings. These occasions were smallish gatherings of food people (I'm not keen on the word "foodies") enjoying a cooking demonstration followed by dinner. In each case, I marveled that the person cooking could do so with such an august personage in the audience. I’ve always been pretty hard to impress — I waste no more than a glance (and not a single thought) on movie stars and other celebrities — but I was more than a little dazzled by Julia! She was quite easy to talk to as she seemed completely unaware of her special standing in these groups. My mother, who died years before I met Julia, would have been so impressed! Anyway ... back to the subject of the little chat referred to in the first paragraph ... When I mentioned putting whole wheat flour in my quiche crust, she got that look and asked why I would ruin a perfectly good pie crust with whole wheat flour. Then she uttered those famous words she's said so many times, even to Jacques Pepin: We're not interested in nutrition, we're interested in taste! So here's the quiche recipe I made up "back in the day;" but for Julia, let's leave out the whole wheat flour just this once! 1 In medium bowl, whisk together flour, salt and baking powder. With coarse grater, grate butter into flour bowl. With fingers, quickly work the butter into the flour, leaving some pieces the size of small peas. 2 In small bowl, combine water and vinegar. Sprinkle over flour mixture while stirring with large fork. Add a little more water, if needed. 3 Turn dough out onto a piece of plastic wrap and flatten slightly into a 4-inch disk; double wrap; refrigerate for at least 30 minutes or up to four days. May be frozen for up to a month; defrost, wrapped, in the refrigerator. 4 Preheat oven to 450 degrees. If dough is thoroughly chilled, let it stand at room temperature for 15 minutes before rolling. On lightly floured surface, roll out disk to a 13-inch circle about 1/8 inch thick. Place pastry in pie plate. * Bake at 450 degrees, lined with buttered foil and weighted, for 10 minutes. Remove foil and weights, and continue baking for 10 minutes. Remove crust from oven and reduce oven temperature to 350 degrees. 5 While crust is baking, prepare filling. In large skillet, heat the oil and sauté onions for 5 minutes. Add mushrooms, zucchini, red bell pepper, half the salt and pepper, marjoram and crushed red pepper to skillet. Sauté vegetables over medium-high heat until all the liquid released by the mushrooms and zucchini evaporates and there is some caramelization. Remove from heat and let cool slightly. 6 In medium bowl (I use a 2-quart glass measure), combine eggs, milk, parsley flakes, remaining salt and pepper, and cheese. Stir in cooled vegetables. Pour filling into prebaked pie shell. Sprinkle with paprika. Bake at 350 degrees for 30-35 minutes or until crust is golden and knife inserted in center comes out clean. * I think a glass pie plate gives the best results, and I always use the Pyrex Clear Oven Ware 9" Glass Pie Plate. There are lots of quiche recipes in Julia's Mastering the Art of French Cooking (2 Volume Set). I've been up since 2:30 CDT for wedding coverage, and boy could I go for a piece of that delicious looking quiche before I take my nap!! :-) I absolutely love quiche, but never make it. Now I will try. Thanks, Judy. Let me know how it turns out for you. I couldn't manage to get up any earlier than 5:00am (my time) so I'm having to catch bits of it replayed throughout the morning. Enjoy your nap! Ah, quiche. Yum! It's a mainstay on restaurant menus in culinarily conservative Lexington, a blessing, in my humble opinion. Your recipe looks particularly good. Guess what we're making this weekend? Thank you! I hope it turns out well for you. Do let me know! Julia Child bakes my bread. So to speak. Delightful anecdote. And I've always been impressed with the fact that you're never impressed by hyped people – merited or otherwise. You go for the substance. Which is probably why your recipes are filled with purposefully healthy things. Julia and I can forgive you for that. :-) Curiously, I think you and Julia are both cut from the same no-nonsense dough, though you appreciate the precision and formality of perfection according to order more than she does. Maybe I'll write a little about that in my next column or Sullygram -- thank you for the inspiration. Thank you, Sully! I'm an odd combination of contradictory characteristics, which is perhaps why I can still surprise my husband once in a while after all these years! This is a beautiful and healthy quiche! i would love to have a piece! Following from foodblogs. Thank you, Katerina! And it's always fun to hear how someone found me. I always cooked with my mom, when she died it made me start my cooking blog as a way to remember her when she died. Glad you got to meet Julia, she was the bomb. Thanks, Mrs. Tuna. Glad to find another woman remembering her mother through cooking. Cooking is my way of communing with my mother and grandmothers. I almost made your vegetable quiche for our Meatless Monday dinner yesterday, but went for tofu curry instead. I'll try this later on in the week! Thanks, Swank! Hope you like it as much as we do! Hey Jean, that looks as positively delicious as the Julia anecdote you've shared :-) I do so looooove quiche and will give this one a try. I think the only thing I'd add to your recipe is a few bite size chunks of a good feta cheese. Hmmm, yum, my mouth is watering already. I was bored with usual meals....came looking for something to fix for dinner....quiche! perfect! Yours looks yummy. One question--why the cider vinegar in the pastry? Thanks, Grant! I bet the addition of "a few bite size chunks of a good feta cheese" WOULD be good! Louise, thank you! So glad you got to meet Julia too--definitely "a treat"! I am very partial to marjoram and use it in lots of things. Sue, I'm so glad you came to Delightful Repast and found something for dinner! You made my day! I think the vinegar (sometimes I use lemon juice) keeps the gluten from making long strands (or something like that!) and toughening the dough. So it helps you make a nice tender crust. I'm kind of with Julia on that one. Good thing that good taste and good nutrition often go hand in hand. And always been a quiche fan, too! Thanks for stopping by, Gisele! I actually feel pretty good about white flour these days, as long as it's organic and unbleached! ha! ha! What a great story! I sometimes wonder when I make something healthier but less tasty if it's worth it or not. Sometimes you have to forget about the nutrition and dig in. Love the quiche! Looks healthy to me! Yeah, you're right - the quiche is plenty healthy without the whole wheat! But, actually, the taste of whole wheat is fine (to me anyway) in a quiche, but it really isn't in a sweet pie (but I've done that!). Great story! I never had the pleasure of meeting Julia, but I know a few people who did and have wonderful stories. She was one of the few people who could be totally natural and "herself" on television, so she was just like that "in person." Oh, what a great story! Thanks for sharing it - and the recipe. I LOVE quiche! Thank you, Caneel! I loved Julia. And I still love a whole wheat crust sometimes! But a lot of the time I make gluten-free. Thanks, Mary! I do like to give a little nod to nutrition whenever I can. I so envy you with that group in your community. Sounds like you're going to have a lot of fun. Ah, I love quiche too! I love its old-fashioned feel, but it does seem to get overlooked these days sometimes; so, I'm always glad when people still eat it and restaurants still serve it. Thanks, Rachel! 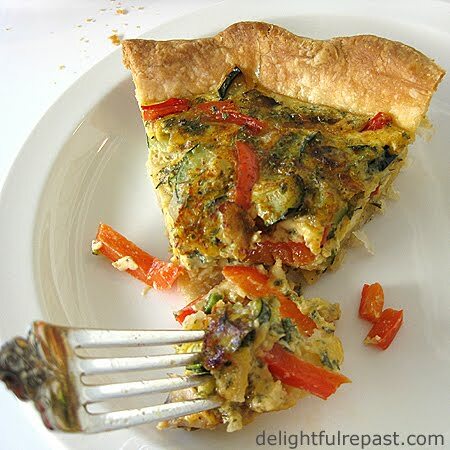 This particular quiche is flavorful enough for dinner and mild enough for breakfast the next morning - I love quiche any time of day!